Zaid Ibrahim & Co (a member of ZICO Law) Partners Tey Lay Kim and Patricia Chia of will be giving a talk at the upcoming Malaysian Property Show hosted by Property Guru. 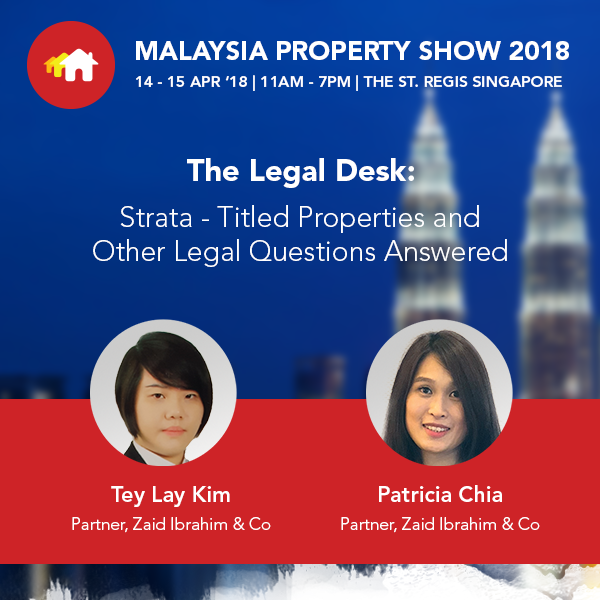 Taking place in Singapore on 14 & 15 April 2018, both Lay Kim and Patricia will be sharing their expertise and insights on the topic The Legal Desk: Strata – Titled Properties and Other Legal Questions Answered on the 2nd day of the event. Their presentation will provide an introduction to strata management properties, the formation of joint management bodies and its functions, as well as the rights of purchasers with regards to claims under the Strata Management Tribunal. This annual event aims to discuss and shed light on a diverse range of questions related to the Malaysian property market. This year’s line-up includes hot topics such as, investment in the Kuala Lumpur and Johor Bahru markets, the impact of Budget 2018 on the property sector, and investment opportunities for new home buyers. ZICO Law is honoured to once again join the Malaysia Property Show and share their experience and expertise on the Malaysian property market. For more event specifics, please click here for the event website.